In August I trapped 147 cats...It was hot and at times I wanted to simply give up. Aftercare is a problem and often involves unloading all the trapped cats the night before in the garage to be kept cool The garage is a lot cooler thanks to the swamp cooler(s) running 24 hours/day in the summer months. The motor broke on one cooler and had to be replaced (thank you Grant!). Sometimes there are up to 40-50 cats in my garage including the ones trapped by Suzie. Nothing about TNR is easy...and summer makes things a LOT more difficult. There were many memorable trapping jobs this summer...probably too many to even write about. The week of the 15th I spent in Buckeye. This required six round trips @ 52 miles each way totaling 312 miles. The good thing was I almost finished one book on CD. I'd recommend it: "Quantum Man; Richard Feynman's Life in Science". Feynman is one of my heroes and his life inspires me to keep tackling difficult, sometimes almost unsolvable problems...like that of homeless cats. Besides, having majored in Physics I am fascinated by the lives and accomplishments of great physicists and he certainly was one. Books on CD are great for long trips...BTW I trapped a total of 18 cats during this adventure over four days. Of course I trapped one last male the morning of the second release and had to drive all the way back to Buckeye to release this one single cat. It always happens this way. I had this happened in Gila Bend and El Mirage. Suzie once took one male cat back to Aguila! I did drop-trap two last cats for a very grateful caregiver last Friday night (9/2). What a rush! there is nothing like getting the last cat, especially when it is the breeding mother cat. As the weather gets cooler in September I am hoping to ramp things up and hopefully beat last year's trapping record. I am shooting for 2,100 cats this year. 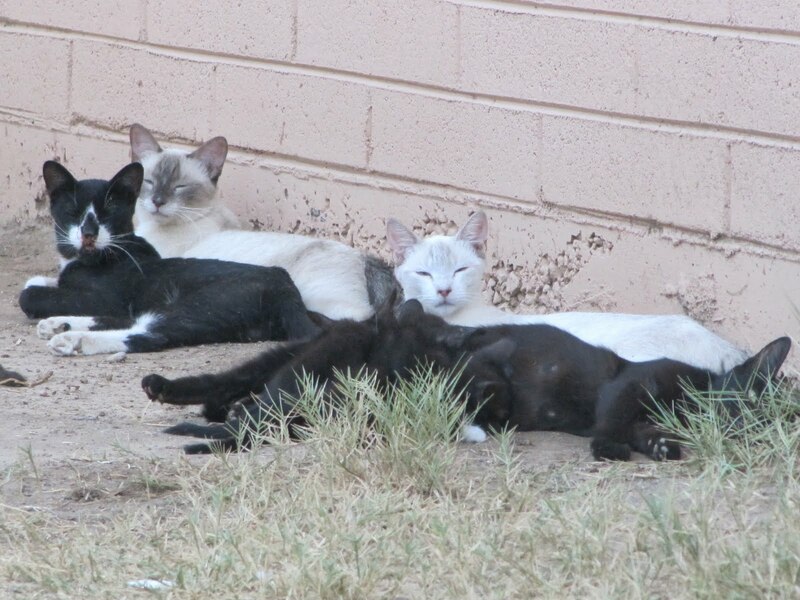 We operate valley-wide (metro Phoenix area) and have caregivers using our TNR program from as far away as Miami (AZ), Casa Grande, and Cordes Junction. One person even came from Agua Caliente! I had to look this one up on the map and it is beyond Gila Bend. I'd like to thank all our volunteers and supporters who are making our TNR program a success!